How do people feel after sharing their story at the Royal Commission? The victims we have supported often end up on an emotional roller coaster with bigger highs and lows than you could imagine. You can find out what it’s like to be a witness at the Royal Commission by reading Jennifer Ingham’s firsthand account. Jennifer went through the ‘Catholic Church Towards Healing’ process. She was awarded a record lump sum payment at her facilitation meeting in Brisbane in May 2013. Peter acted for Jennifer at the facilitation and encouraged her to speak to the Royal Commission. Jennifer was asked to be a public witness in the Case Study 4 hearing in December 2013, with Peter representing her at the hearing. In the lead up, you are often running purely on nervous energy. Obviously, giving evidence is an intense and emotionally draining process. Straight after leaving the Commission room, they are usually on an indescribable high, filled with a feeling of incredible relief. It’s so rewarding to see the satisfaction etched in the face of these brave people as they take their first steps outside the Royal Commission courtroom with more freedom from their past than ever before. There is a feeling of euphoria. Our clients often tell us they realise they have just done something genuinely important for their country. Victims know that their experiences have finally been properly acknowledged. They are often buzzing with excitement, having received a standing ovation from the public gallery, from people who are inspired by their courage and who can relate to what they’ve been through. After the initial excitement, some people are left feeling emotionally drained. It’s not unusual to feel blank and exhausted. Often you need time to process the confronting and traumatic memories. A period of huge emotional turmoil has ended and the unrelenting drive to stay strong and push forward for your Royal Commission date is suddenly no longer there. Sometimes the emotional weight that is lifted frees victims from the demons of their past. Often the Royal Commission signals a complete positive transformation in the people we work with. However, many experience some difficult times at this stage. I found the weeks after the public hearing draining. I kept to myself. I simply did not want to see anyone. I realised I just needed to ride out the sadness, the exhaustion, the anger, the relief and the ‘I’m so glad I did it’ emotions. It’s so important to rely on your support network during this period. Peter and the Kelso’s team will be there to help you through. With our years of experience, we can help you understand what to expect and work with you to keep moving forward with your life. We will also make sure you have the best possible chance to achieve fair compensation after you have presented at the Commission. Your experience giving evidence at the Royal Commission may not be easy, but it could well be the most important event of your life. The Commission is gaining more and more momentum as public interest and support intensifies. 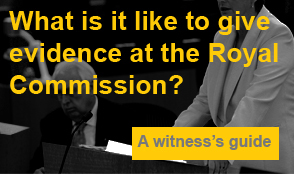 The Royal Commission are calling for more victims and witnesses to come forward now. We want to help you make sure you get the best possible chance to achieve justice.